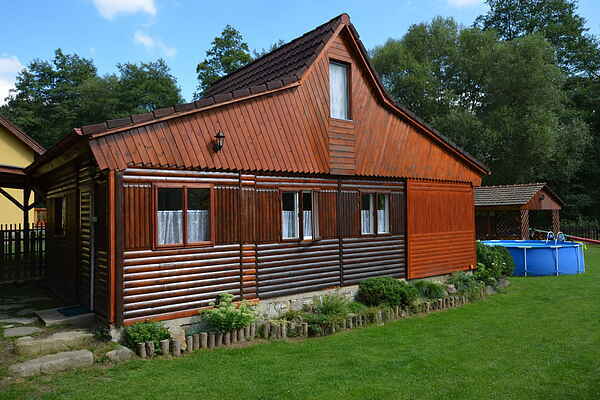 This charming home, Jir, lies at the edge of the peaceful municipality of Staré Dobrkovice, just 2 km to the west of Český Krumlov. Your home has an enclosed garden with a swimming pool and is perfect for avid fishers. For fishing, you can head to Nový pond (roughly 5 km away) or go directly to the brook (trout river) adjacent to the enclosed garden. Jir is located on an estate that also contains the home of the owner. You can easily walk to the historic city of Český Krumlov. The attractions in Český Krumlov are protected by UNESCO. The city of Český Krumlov is the second most visited city in the Czech Republic after Prague. An evening stroll through the city is well worth it. The Lipno reservoir as well as the Zlatá Koruna and Vyšší Brod monasteries are also close to the home. Rožmberk Castle is also worthy of a visit. A canoe or raft trip down the Moldau River (Vltava) is stunning. Reserve at least one day for this. The canoes and other necessary equipment can easily be hired from one of the many rental locations.